The latest dresses are available at Pothys in different colours, patterns and designs to suit an individual's preferences. Kanchipuram silk sarees are a marvel in itself and these enigmatic collections are a symbol of our culture and tradition in every South Indian ceremony. These beautiful attires are loaded with checks, stripes, floral and temple patterns and have been inspired by mythology and the nature around us. These sarees can be easily distinguishable by the wide contrast border which is designed separately and attached to them. The zari used also comes from different regions across India and adds up to the attire on the whole. Think Kanchipuram silk sarees and think of the tradition and we at Pothys have a range of such collections that portrays the finest in both custom and fashion. Come, check out our Sarvalakshanam Pattu which goes by the name of Samudrika Pattu that is one of the finest examples of craftsmanship and grandeur. This exclusive range wedding silks sarees would sure bring down the abode of heaven right at your doorsteps and the intricacies used in the patterns would be the talk of the town even after the wedding. Creativity makes a major part of such designs and at Pothys we make sure that you get a rich quality combined with an amazing finish that makes them one of the most enviable wedding attire of India. Come take a walk through our online store and redefine how wedding silk sarees of Kanchipuram can change your life. Compliment a Kanchipuram silk saree with a trendy gold collection and a traditional accessory to finish the touch. That's all! One's all set to render an ethnic look in the most beautiful form. Get mesmerized by the grandeur and steal the show every time you step out to a function or a wedding. Walk into our online area today and check out the opulence that is simply known as our very own Kanchipuram silk sarees. I would like to Buy Indian Kanchipuram Pattu Sarees Online! 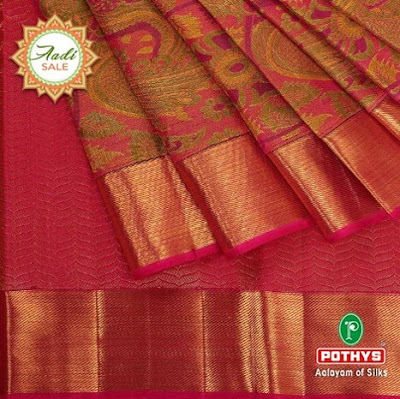 The Aalayam of silks Pothys is brand well known for silk sarees in Tamil Nadu. Handloom sarees – A Class Apart!